Past, Present & Future – Ee-Jay Motor Transports, Inc.
Ee-Jay Motor Transports, Inc. was founded by E. J. Dougherty in 1953. 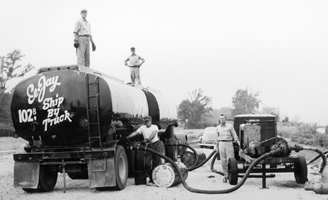 In 1957 Ee-Jay built and operated a liquid petroleum wax storage and blending facility in East St. Louis, IL that was designed by Socony-Mobil Oil Corp.
Customers included Mobil, Sun Oil Corp, Gulf and a number of brokers. While most of the wax was destined to dairies via Ee-Jay Truck and used to coat the cardboard milk carton, much of the wax was blended and packaged in fiber drums for shipment to a wide variety of end users from candle makers to tri nitro toluene (TNT) Dynamite stick manufacturers. 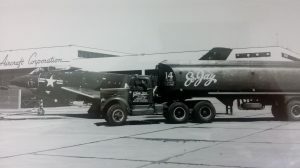 Interestingly, Ee-Jay delivers plastic pellets for the molding of milk bottles today to the same dairies it delivered liquid petroleum wax to nearly 70 years earlier. 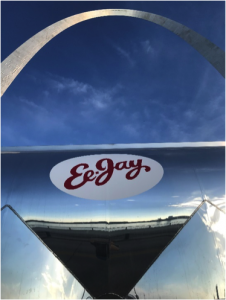 In 1992, by invitation from our existing customers in East St. Louis, Ee-Jay opened and continues to operate today, a full service satellite terminal in Minneapolis / St. Paul, MN. 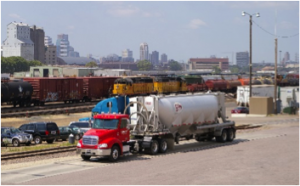 Ee-Jay, now 4th generation family owned and operated, offers railcar storage, transloading, delivery, warehousing and packaging to customers across the US and Canada via full service terminals in both St. Louis / East St. Louis and Minneapolis / St. Paul. Commodities handled have expanded to include a diverse group of both dry and liquid bulk commodities. Our management team, with decades of experience, has made us industry leaders in the safe and proper handling of bulk commodities. Ee-Jay is excited to continue its growth while maintaining the vision of its founder – Providing a level of Service for its Customers that is second to none. Contact Ee-Jay today to find out how you can be included in our future plans!